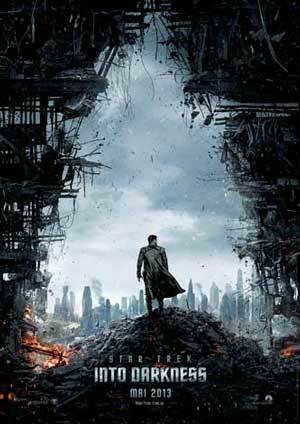 Captain Kirk (Chris Pine), Spock (Zachary Quinto) and the crew of the Enterprise have to boldly go to Klingon territory to stop the one-man army John Harrison (Benedict Cumberbatch). 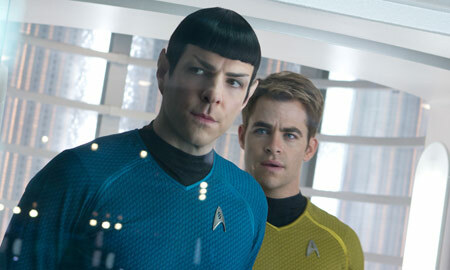 Nimble sequel to J.J. Abrams' 2009 reboot „Star Trek“ and an almost perfect sci-fi action spectacle. The crew of the USS Enterprise is literally caught between the devil and the deep blue see, for the directives forbids Starfleet to interfere with the evolution of another species (which includes sightings of the spacecrafts). 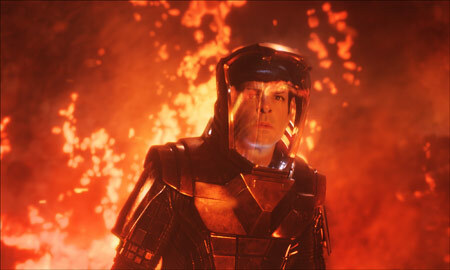 But the half-Vulcan Spock (Zachary Quinto) stands in an active volcano and is intent to sacrifice himself for the crew, and neither Nyota Uhura (Zoe Saldana) nor Captain James Tiberius Kirk (Chris Pine) want to let that happen. 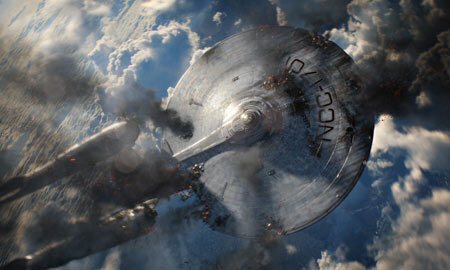 After they got out of that mess and returned to Earth safely, Kirk loses the commandership over the Enterprise. 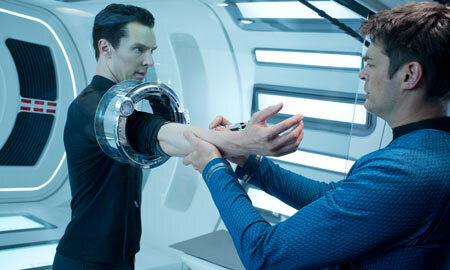 He has lied in his reports, whereas Spock reported veridically that Kirk disregarded several rules. On the other hand Kirk's daring nature is what impressed Christopher Pike (Bruce Greenwood), the former captain of the Enterprise, in the first place. That's why he offers Kirk to be his first officer. When a desperate suicide bomber destroys a public building in London, the mastermind behind it is soon identified as the cold-hearted John Harrison (Benedict Cumberbatch) – one from within their own ranks. The Admiralty of Starfleet Command discusses what's to be done, but their meeting is target of Harrison's second attack, after which he flees. Four years ago, producer and director J.J. Abrams ("Lost", "Mission: Impossible III") revitalized the Star Trek franchise by starting to re-tell everything all over again in "Star Trek". 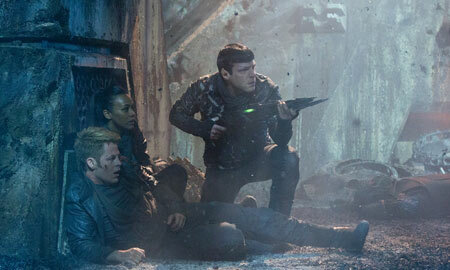 The modernized and action-packed reboot was globally successful and led to the sequel "Star Trek Into Darkness", which Abrams and his almost identical team conceived and implemented. The good thing about it: the team is operating well together, knows the Star Trek univers very well by now, has a vision and especially the budget to realize it. As the characters were already established enough in the first instalment (except for a very few new contracts), the filmmakers could hit the gas right from the first minute: and thus "Into Darkness" commences with a chevy on the unknown planet Nibiru, a volcano about to erupt, and a jump off high cliffs. But then quieter passages follow, until the actual threat and plot picks up pace again. Still audiences don't have to fear to be bored by action-thriller specialist Abrams. To the contrary, "Into Darkness" is gloomier, faster and more agile than its forerunner from 2009, it has less technical theory and a significantly maturer adversary. 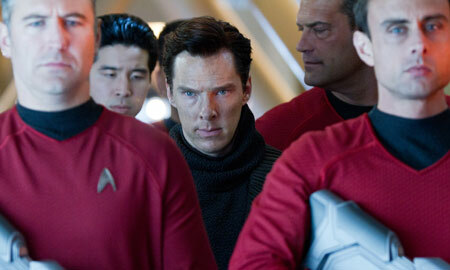 The villain has been one of the minor flaws of "Star Trek". 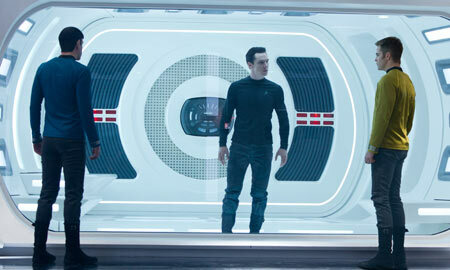 But then again the humor about the characters' quirks is not as amusing as in Abrams' first instalment. Though the sobriety fits into the whole cosmos of film series and serials, "Iron Man 3", which opens just slightly earlier, sets a new high standard for entertaining 3D blockbusters. 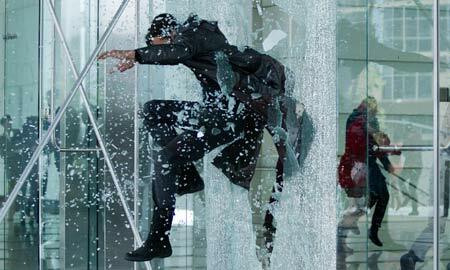 It does so with a good balance of vulnerability, action and very enjoyable comic-relief slapstick. Both sci-fi spectacles are – in their own ways – perfect events suited for the masses, both perfectly within the zeitgeist of modern action cinema trends. Certainly "Star Trek Into Darkness" has its shady sides, too, for the characters (see humor) suffer under the shifting action plot. It comes especially hard for the new one on the team: Dr. Carol Marcus (played by Alice Eve). She doesn't even get integrated into the crew really, but only has to show up when the plot is in need of her (and a new twist). And the back and forth threatens to burn out the audience in very much the same way as the maltreated Enterprise. But what a ride this excessive spectacle is! With this second bang the rather tech-savvy Star Trek audience will be broadened by many new fans, because "Into Darkness" doesn't require much prior knowledge of the previous 10 movies and 4 serials (though it brings more pleasure). This film will excite anticipation for many more instalments to come. 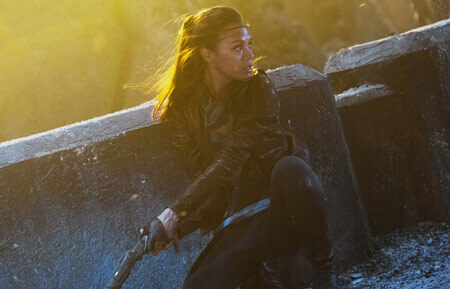 Although I was never much of a Star Trek fan, I'd like to add a more personal commentary that this new film series seems somewhat interchangable in its modernity and action-driven plot centered simply around defeating the villain. Whether it was labeled "Star Trek" or had set up its own cosmos, doesn't make much of a difference to me. So it's a good that hard-boiled fans are monitoring every of Abrams' steps.